With a metal exoskeleton design and a covering of glittered crystals,clutch bag adds instant style and on trend sophistication to any evening outfit.The Hardcase Clutch bag has a hard sided, structured shape with a colorful exquisite peacock over the body and metal work that's as romantic as you are mysterious.The main compartment is small, secures with sparkling 2 strong magnets to hold the top closure tightly shut, while 2 blue crystal-studded knobs allow you to open the handbag whenever you need to,and features a vinyl fully lined interior that offers plenty of storage for all of your essential items such as makeup, tissues, and identification cards.Eye-catching and all matched for your evening parties,night out or just for dating.By the way,this small clutch evening bag comes with its original box! Approximate Dimensions:6.69"L X 4.13"H X 1.77"W, Chain Strap 20.08". With a metal exoskeleton and vinyl lined design and a covering of glittered crystals. 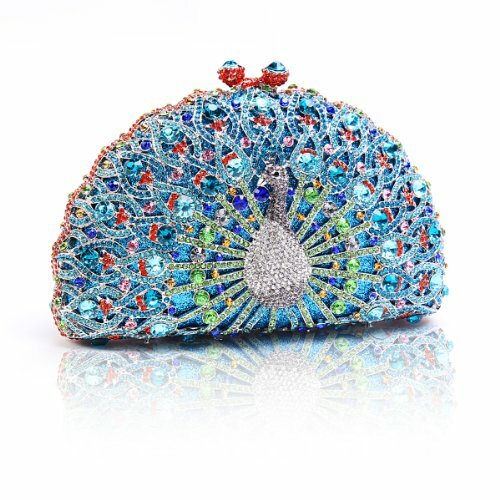 The Hardcase Clutch bag has a hard sided,structured shape with a colorful exquisite peacock over the body and metal work that's as romantic as you are mysterious. The main compartment is small, secures with sparkling 2 strong magnets to hold the top closure tightly shut, while 2 blue crystal-studded knobs allow you to open the handbag whenever you need to,and features a vinyl fully lined interior that offers plenty of storage for all of your essential items such as makeup, tissues, and identification cards. Eye-catching and all matched for your evening parties,night out or just for dating.By the way,this small clutch evening bag comes with its original box! Approximate Dimensions:6.69"L X 4.13"H X 1.77"W, Chain Strap 20.08". NOTE:Different people with different measurement,so it may exist 2-3 measurement errors.Hope you will not mind it.Due to monitor variations colors may appear slightly different. If you have any questions about this product by Damara, contact us by completing and submitting the form below. If you are looking for a specif part number, please include it with your message.